Eye to eye. Which of us is going to blink first? Probably me. It’s pretty silly to challenge an owl to a staring competition. In a city like Tokyo, it should probably be no surprise that I find myself in this situation. With an owl named Negi perched on my arm, I try to act calm. It’s easier said than done, considering Negi did just try to eat Peanuts a few minutes ago. Peanuts is the name of one of the other owls here. By now, a lot of people have heard of the ‘cat cafes’ that began in Tokyo and have now spread around the world. They are places where people without pets can come for some animal interaction. Last time I was in town, I visited one and you can read about that cat cafe here. 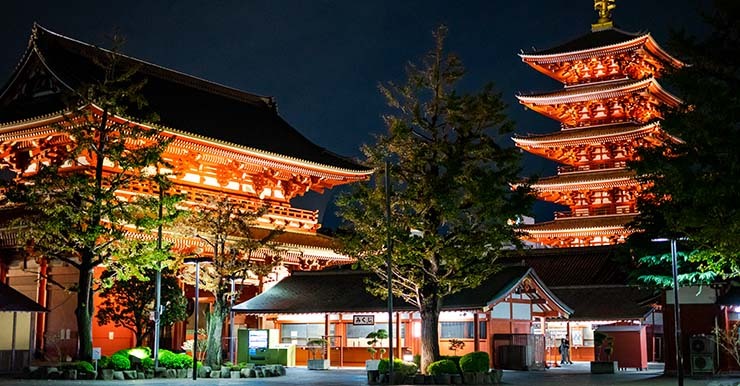 But Tokyo is the kind of city that always needs something new. It has a reputation for being cutting edge and it never disappoints. One of the latest trends is the ‘owl cafe’ and it’s where I find myself one afternoon. You enter the small room off a busy street in the Akihabara district at your allotted timeslot. 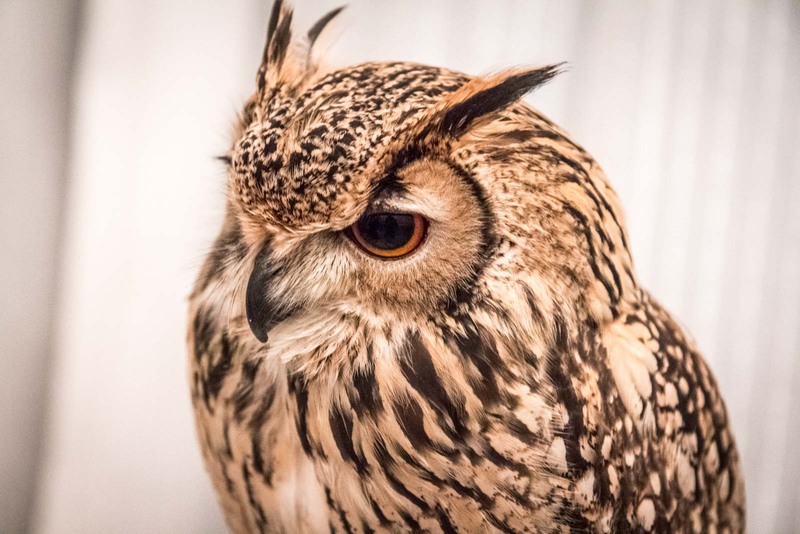 After a brief introduction in Japanese – no flash photography, no sudden movements, don’t squeeze the birds – you then have an hour to spend with the owls. There are about twenty owls in the cafe, perched on bars throughout the room. Each has a name and with that, presumably, comes a personality. Some are small and sweet, others bigger and evil-looking with vibrant eyes that are constantly watching their surroundings. There are owls that seem sleepy and owls that seem more alert, owls that barely move and others with heads constantly bobbing. I’ve been told you can pat them but I’m hesitant. Apart from their sharp beaks, I’m worried the birds might not like it, but I follow the lead of the Japanese people in the room. So I approach one of the smaller owls and gingerly brush my fingers on the top of its head. 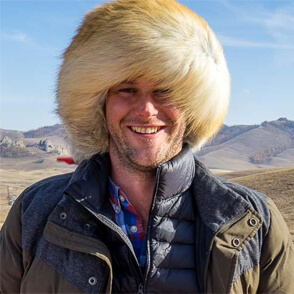 It’s soft. Really soft. The owl just looks at me but doesn’t seem bothered by the attention. It starts to turn its head towards me and I quickly jerk my hand away in fear. I forgot I wasn’t supposed to make sudden movements. Some of the Japanese people in the room have jumped straight in and now have owls on their arms. The workers – dressed in waistcoats and hats – take the birds off their perches and put them lightly near the customers’ wrists. A small rope stops them flying off if they are in the mood for flight, which most don’t seem to be. It goes like this for an hour – patting, holding, looking. I don’t do much holding because I am still a bit nervous but I enjoy the looking and the occasional pat. I can’t tell whether the whole experience is supposed to be a novelty or whether it’s the kind of thing that people come back for repeatedly, which was the sense I got with the cat cafe. 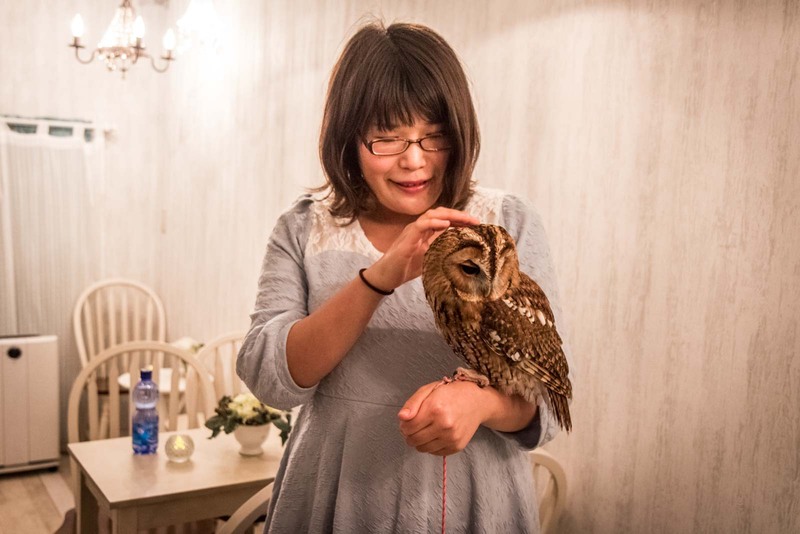 The owners of the Owl Cafe say it’s about relaxation. In a world where people can get easily stressed and have busy hectic lives, this is supposed to be a bit of an escape. “We think owls can heal our tired hearts like a therapy,” they say. The whole room is designed around this philosophy with soft lighting, drapes on the walls and mood music softly playing in the background. It’s certainly a more mellow environment than outside in Akihabara where neon, blaring sounds and bustling crowds fill the streets. So it’s about “healing entertainment” apparently and I can see that to a certain degree. For the humans, at least. I do wonder, though, whether it’s fair on the owls. When I ask about that, I’m told that all the birds are raised from birth and are treated like pets. Maybe they would prefer to be out flying free or maybe they’re happy with this life. In many ways, it’s no different to keeping a dog, a cat or a budgie as a pet. Is that what Negi is thinking about as we stare at each other? Is he wondering why I’m here at all? I guess I may never know. I blink first and the staring competition is over. My hour is up and I leave the mellow dim room and the owls behind, back onto the Tokyo streets. 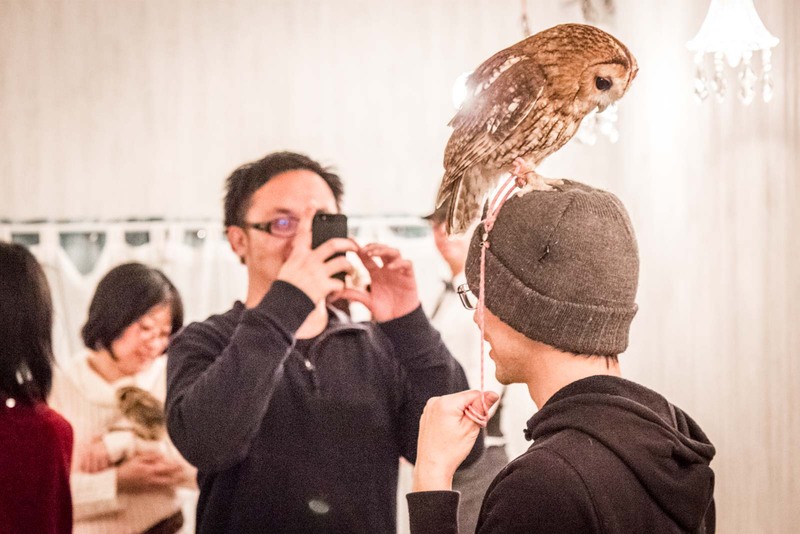 Where is this Tokyo Owl Cafe? 67 Kanda Neribeichō, Chiyoda-ku, Tōkyō-to, 101-0022, Japan. How do you get to the Owl Cafe? To get to the Akiba Fukurou Owl Cafe, catch the train to Akihabara. From there, it's just a short 5 minute walk (and I suggest you use a map) to 67 Kanda Neribeicho. The owl cafe is on the ground floor in a small quiet street. You'll recognise it because it will have some photos of the owls on the window outside. When is the Owl Cafe open? The cafe is open at different times each day - normally from about 1100 until either 1800 or 2000, though. It's important to check the website (below) in advance. How much does the Owl Cafe cost? You need to reserve a spot in advance to be sure you'll be able to get in when you want. (You can turn up and try your luck, but it's not advisable because it is pretty popular). I recommend using the link below - especially if you can't speak Japanese. I too was wondering whether or not the owls would want to be out flying free in the wild, but thinking about the context of them being raised like cats and dogs, maybe they are fine being pets. Yeah, I hope so. They are certainly well looked after. An owl cafe? What a fascinating concept, and such gorgeous birds, too. That’s exactly the conclusion I came to as well. The initial response is to assume they would rather be off flying through the woods… but couldn’t the same be said for cats and dogs (well, not the flying bit, but y’know…). I should also mention that they had signs not to touch the birds which had already had a lot of attention during the day and they rotate the signs around so they each get a rest. Do they sell food or is it purely a cafe just for looking/patting the owls? There’s no food – just owls. You get a free soft drink but everyone is too focused on the animals to get anything else, it seems! Hi Michael, I was wondering if you could help me with directions? I’ll be in Japan next week with family and my nephew and niece loves Harry Potter hence I think they would love to visit this owl cafe. We’ll be staying 1/3 Akihabara service apartments so coming from Akihabara station, how do we proceed? Thanks! Hi Isabela. I hope I’m not too late with the directions. If you look at the info box at the bottom of the post, you’ll see a link to the location on Google Maps. If you then put in your address, you’ll be able to get exact directions. Good luck! Great article. Thank you for sharing you in-depth experience at the Fukuro no Mise. I recently went to the Fukuro no something..I don’t even remember but it was different from the cafe setting. It is in Kamakura and the entry charge was 600 yen and they didn’t have specific time assigned to each guest. We saw at least seven owls and one of them was very large and another one was the same kind, which appeared in Harry Potter movie series. So I got very excited. I am still not sure if Owls in captivity are actually happy , given that they are not very social. They don’t really like to be touched..that’s what I learned at least but I can’t help wanting the small one! Thanks for the info. I hadn’t heard of the one you’re talking about but it doesn’t surprise me that there are a few other places like this in Tokyo. Once something becomes popular, the same thing pops up all over! Thank You for writing about this experience. It sounds interesting and by one way exotic. ‘Exotic’ is a good way to put it. It’s certainly an odd experience that I think is quite unique to Japan. I hope you enjoyed it and it was what you were hoping for! Hello! I like to ask, must we make a reservation before going to the cafe? 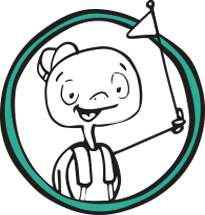 It is very popular and normally there are no spots available if you don’t make a booking. I would suggest using the links I have in the article to guarantee a spot. What is wrong with everyone? This is not okay! These birds are not okay. Owls don’t want to be touched. Owls don’t want to be tethered and restrained. Owls are a nocturnal and solitary species. Owls belong in be wild. If you can’t see what’s wrong with this then I worry for the wellbeing and welfare of all species on this planet. I’m not sure it’s that simple. While I had reservations about this for the same reasons you do, speaking to the people who run the place, you can see how much they care for the birds. I agree – birds belong in the wild, but so do dogs and cats and they can be quite happy when they’re looked after as pets. as no thought is given to wildlife and how this sort of existence affects them. 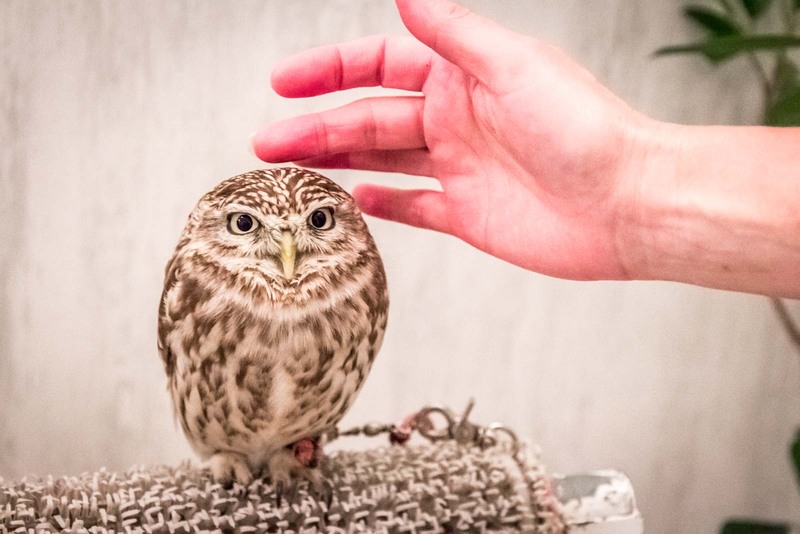 It is with great sadness that I read this article about the “Tokyo Owl Cafe” where humans have set up “a bit of an escape” to “steal our tired hearts like a therapy” where they go to feel good when stroking captive owls. Owls were NOT naturally born to be tethered by a piece of rope to a post in a room with “soft lighting, drapes on the walls and mood music” and to be visited by throngs of humans with their different noises, smells and touches and tensions – For God’s sake humans!! This is so wrong!! Owls are nocturnal creatures who live in quiet and natural lighting in their natural environment! How sad to see the owls sitting in this environment – some hardly moving, some with eyes closed and some with heads constantly bobbing – a sure sign of captivity neurosis. One wonders if Negi attacked Peanuts due to pent up stress??? I do not see the difference between this and the chained up monkey and parrot on a street hawker’s shoulder..at least there, they are out in the open. How far can a society be dumbed down to not acknoledge another beings habitat or mannerisms.. we have done that to dogs and cats where there are some similarities to our environment, in that we now, can eat the same food, sleep in a bed, drink from a bowl etc but these animals are allowed freedom to wander at their own will. owls here are not allowed any freedom and are nocturnal, they really dont like loud noises either… so this is very wrong…please, please shut this place down and put these poor, lovely creatures in a better place preferably without human contact…. Hi David. If you’re interested in visiting the cafe, I would recommend using the links I have included in this article. Enjoy! I have been waiting for Michael to get back to me after saying he would do so but he hasn’t followed up. As I haven’t heard back let me leave the original message I sent him on behalf of Animal Rights Center Japan (ARCJ). It is, indeed, very disappointing to see this page actively promoting animal cruelty and I hope that anybody reading this will take the time to reconsider visiting one of these cafes and choose not to be complicit in such abuse. We, the Animal Rights Center Japan (ARCJ), are a non-profit organization working as a group of activists to advocate for animal rights in Japan, and we are dedicated to educating the public on animal rights and animal welfare. 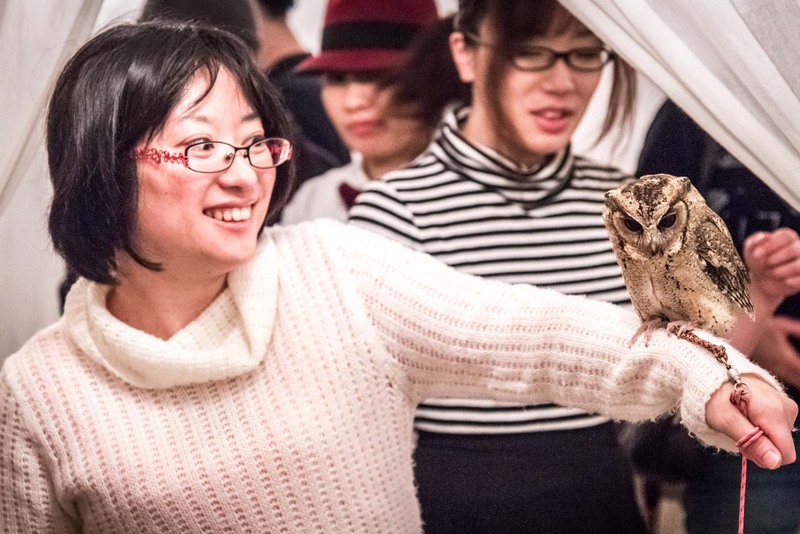 We are writing to request that you consider ceasing to advertise tours to owl cafes in Japan. 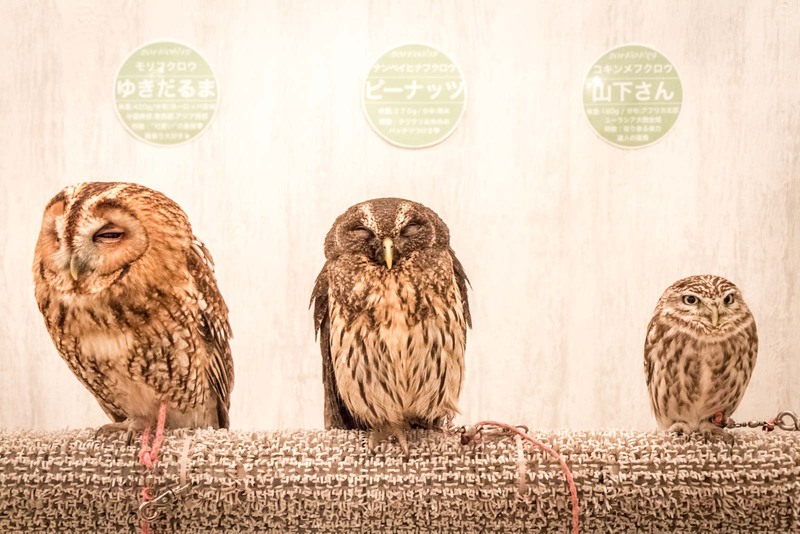 At these cafes owls are typically displayed with their legs tied to a short leash in order to prevent them from flying freely – they are basically chained all day. In most cases they are given neither sufficient time to rest nor a place to drink water. 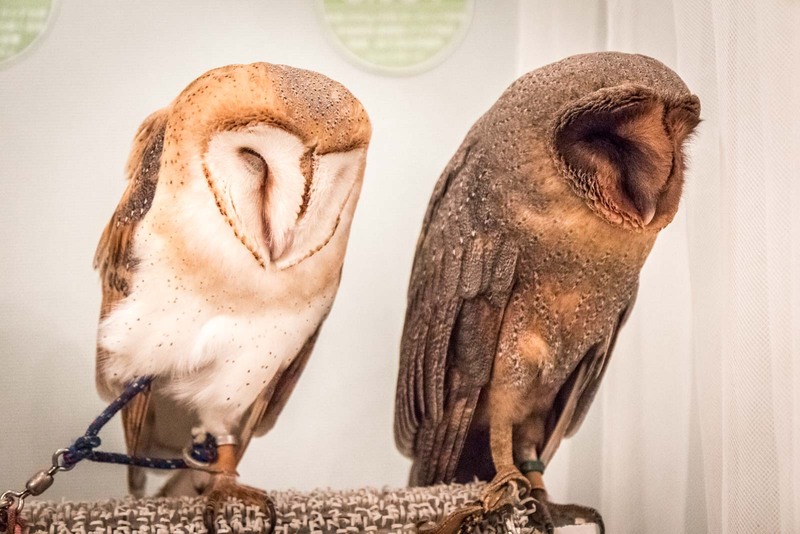 As commonly known, the vast majority of owls are nocturnal; however, owls in owl cafes are not only constantly exposed to artificial lighting but also deprived of the opportunity to bathe in water or saturate themselves with dust. This is in their nature. 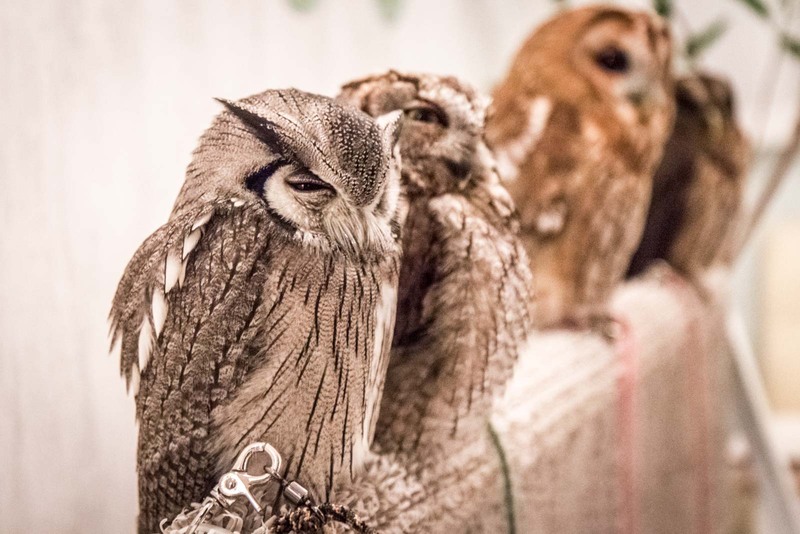 Thus, the manner in which owl cafes exhibit and raise owls in order to attract customers directly goes against their nature and violates the applicable law and standards in Japan. Moreover, it is important to note that even if under a human’s care, raptors (including owls), are wildlife that have not been domesticated by humans historically. There are growing concerns about subjecting wildlife to interactions with humans as pets. 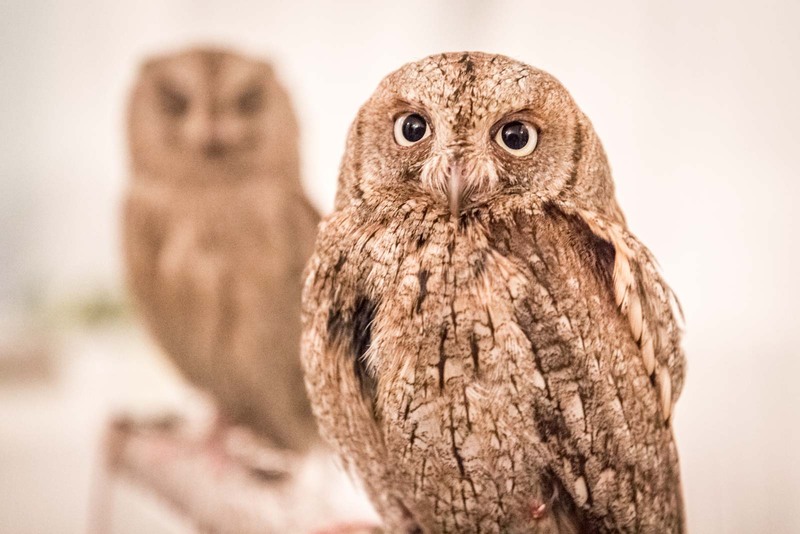 More and more people are demanding protection of these owls in Japan. As of March 1, 2017, as many as 52,654 people had signed a petition requesting the cessation of exhibitions and sales of raptors, as well as their forced interactions with humans. 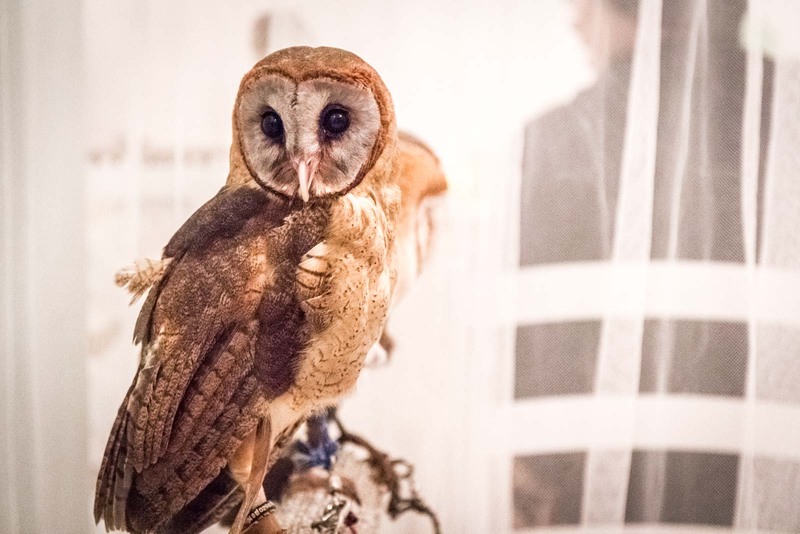 Upon our request, several corporations have agreed to cease exhibitions and sales of owls. It is our sincere hope that you join us in our efforts to make our society a place full of compassion for animals. 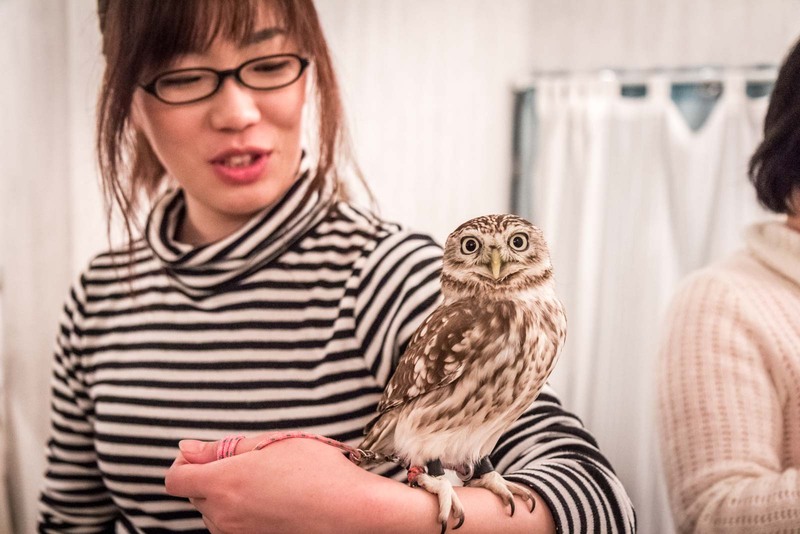 We would greatly appreciate it if you could share with us your thoughts, in writing, on this important issue impacting the wellbeing of owls kept at cafes in Japan. Our fax number, mailing address and email address are listed below. Owls usually sleep during day time and active at night . So this cafe must be functional only at night ? Thanks to your blog and traveling experience I am getting to know so much. please try out the danish open-faced sandwiches with ryebread and sourdough bread. look up on the net for colour photos + text simply mouthwatering. serve with white wine, cold beers, ice-cold schnapps with dill taste. your cafe has been recommended by friends in Tokyo. may i wish you all a very bright, peaceful, breezy day. happy new year 2019 and the coming years. all the very best in the future at your cafe. This sounds like a unique experience! We have an Owl Cafe here in Albuquerque, but, no real owls… the building IS shaped like an owl, though! The original location, about 75 miles south in the village of San Antonio (home town of Conrad Hilton) was a favorite of the Manhattan Project scientist, being fairly close to Trinity Site.